I was honored today to see the announcement that I was awarded the title vExpert for the 5th year in a row. 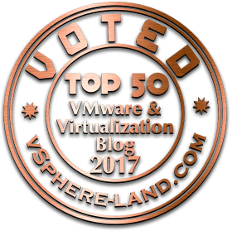 vExpert is a title that VMware awards to those that have made significant contributions to the VMware community. The title doesn’t show a particular level of technical expertise; but rather shows that those awarded have a strong desire to share what knowledge they have with others. 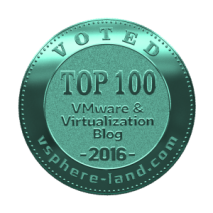 Most vExperts either blog, are VMUG leaders, speak at local events, contribute on the VMTN boards, or even speak at large events like VMworld. Special thanks to many of the VMware partners that provide perks for the vExperts, including Pluralsight! 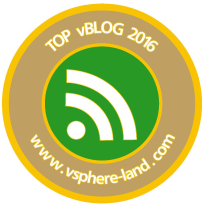 Top vBlog 2016 Results – I’m in top 100!